At EverLine we provide Saskatoon and the surrounding area with high quality, highly durable outdoor line painting. Our highly trained crews are provided with high end equipment and high quality products to deliver perfect road marking results. At EverLine Coatings we are a company that specializes in outdoor parking lot line painting in Saskatoon and all of Saskatchewan. We supply professional and high quality road marking services for all parking lots we work on. We are experts at completing re-paints of parking lot lines, curbs, stencils, crosswalks, stop bars, arrows and handicap spots. We also provide all the services you will need to implement a new parking lot layout for your business. One of the factors that sets us apart is the fact that we only use the highest quality products. This allows us to ensure your new parking lot lines will be durable and last longer. 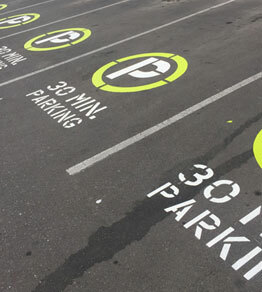 It also allows us to paint lines that are cleaner, more environmentally friendly, more reflective and look great. Being one of Alberta’s largest paint buyers also allows us to pass our savings onto you. This means we provide the highest quality services that will work within your budget. EverLine Coatings and services brings a level of service, quality and professionalism that our competitors cannot. We have decades of experience in the line painting industry and have seen and done it all. No matter the surface, no matter the size of your parking lot our team can deliver a precise and long lasting line painting project. We offer a number of advantages that lets us stand out including a multi-crew approach, cutting edge equipment and superior products. Our multi-crew approach allows us to handle multiple jobs at once, complete line painting projects at night and during off hours and respond at a moment’s notice. This means if you need multiple properties painted at the same time we can do it, if you need your property painted at any time of day or week we can do it, and if you need your parking lot painted on short notice we can do it. EverLine’s commitment to quality and customer satisfaction will ensure your business will receive the best possible line painting project. Part of what makes EverLine the leader in line painting projects is the high quality products we use. We use a product called TBL Durables to ensure we deliver durable, precise line painting results that look great. TBL Durable paints dry quicker, are more reflective and most importantly much more durable than any other line painting project. This means your parking lot will need to be repainted a lot less often saving your business money. To learn more about our TBL Durables products please click here. At EverLine Coatings and Services we are the authority for outdoor line painting projects. Our decades of experience means we have seen it all and done it all. We have completed road marking projects on parking lots, parking garages, pathways, roadways and more. No matter where you need an outdoor road marking project done our team can deliver exceptional results. In addition to delivering outstanding painting services we can also help with parking lot layouts. Our industry leading experience means we have seen all types of properties and have seen what works and what doesn’t. Our team is more than happy to help you create the most efficient parking lot layout possible. If you have scheduled an appointment to have our line painting crews perform a line painting project at your property there are a few things you can do to prepare. In order to ensure our crews can perform a high quality and efficient line painting service please make sure you follow these steps. First please ensure that your parking lot has been swept immediately prior to our crews arrival, this will ensure a precise and durable painting job. Next please make sure all vehicles have been removed from the parking lot so our crews have enough room to work. Finally make sure all obstacles and debris have been removed from the property to ensure our crews can finish your project on time. At EverLine Coatings and Services strive to provide the best value possible to our clients. In order to deliver the most value we provide prices based on the specific details of each job. Our rates will fluctuate based on volume, difficulty, traffic and materials being used on site. At EverLine we have experience working within a wide variety of budgets, and will work with you to deliver a project that works within your budget.